Today, you are a member of... Your Jets - You Are A Member! 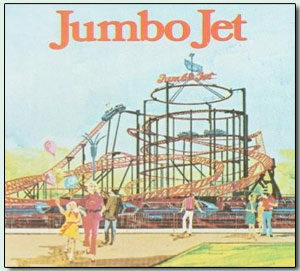 In 1972, Cedar Point, the greatest amusement park in the world (located in Sandusky, Ohio) erected the fancy new Jumbo Jet atop the ground the once hosted the original Cyclone wooden rollar coaster (razed in 1951 for its rotten condition). The exceptional thing about the Jumbo Jet was its Electric Spiral Lift technology, a novelty at the time, which motored riders up to the apex via a graded helix track instead of lurching them straight up an incline via chain pull. After six years at The Point, the Jumbo Jet turned nomadic and has been shifted around to different parks around the world and is currently unaccounted for, though rumor has it the JJ is still flying thrillseekers around in a park in Russia or Belarus. Your mission this week, members, is the same as the coaster campain concerning the Jumbo Jet: remember previous innovations and figure out just where the hell your Jets are firing.